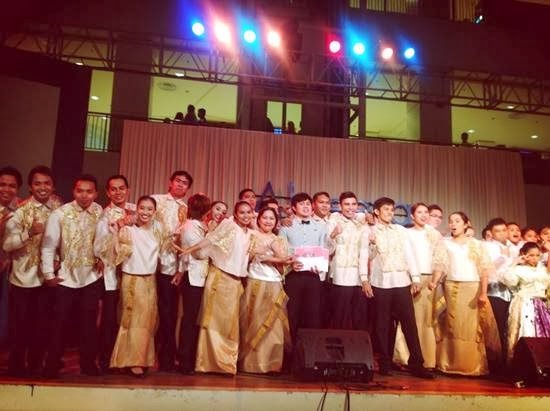 The South Cotabato Chorale emerged as the Champion in the recently held "Harana sa Abreeza" Mindanao-wide Choir Competition last Saturday, February 15, 2014 at Abreeza Mall in Davao City. Composed of 22 members with their conductor Ryan Corneta, the South Cotabato Chorale impressed the judges with their renditions of Daniel Padilla's “Nasa Iyo Na Ang Lahat” and T’boli song “Koyu Mo Tebulul”. The group bested 11 other top choral groups from all over Mindanao and bagged the P30,000 cash prize as champion. Other winning groups were the University of Mindanao Chorale which was declared 1st Runner-up and the Ateneo de Davao University – Conservatory of Music which settled at 2nd runner-up.